What a midterm election — in Suffolk County and the nation! The Suffolk County legislators’ reasons for voting ‘no’ varied: the inconvenience of moving staff, the cost of added mileage or a reluctance to mess with a government they say already works. COURTESY PHOTO | A worker testing for ticks in an open field last spring. 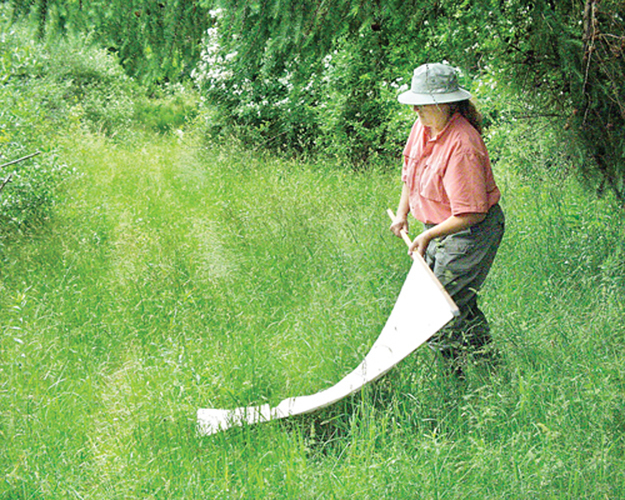 Tests in June showed a spike in the tick population of 200 percent at Mashomack in one year. In an effort to combat tick-borne illnesses, Suffolk County Legislator Jay Schneiderman (I-Montauk) has introduced new legislation to step up pressure on Suffolk County Vector Control, which is in charge of controlling the spread of insect-borne diseases. The proposed law would require Vector Control to submit an annual plan that indicates steps being taken to reduce the incidence of tick-borne illnesses — including work to be done, active measures being taken and an analysis to determine the effectiveness of the program. The division has focused mainly on mosquito-borne illnesses like West Nile. Town Supervisor Jim Dougherty has repeatedly said the county should get involved since tick borne illnesses are a more serious public health crisis than mosquito borne illnesses. Area hospitals reported a spike in tick-borne diseases, including Lyme disease earlier this year. Nearly 300,000 cases of Lyme disease are reported nationally each year, while 1,000 cases of West Nile are reported, according to the Centers for Disease Control and Prevention. Lyme disease is now the most widespread tick-borne disease in the U.S., but cases are often under reported across the U.S., according to the CDC. It is estimated only 10 percent of total cases nationally are reported, CDC officials said. Because of redistricting, Mr. Schneiderman faces off this November against Southampton Town Councilman Chris Nuzzi, running on the Republican ticket, to represent Shelter Island in the county Legislature. According to Mr. Nuzzi, his opponent’s action is a case of better late than never. Mr. Nuzzi and Mr. Schneiderman will square off for a debate October 12 at the library sponsored by the Reporter, The League of Women Voters and The Shelter Island Association. County Legislator Al Krupski, a co-sponsor of the bill, called Lyme disease an epidemic on the East End. Mr. Schneiderman said the county has, however, done a good job preventing West Nile. While mosquito and bird samples have tested positive for the virus, no humans have tested positive for West Nile so far this year, according to the county health department officials. 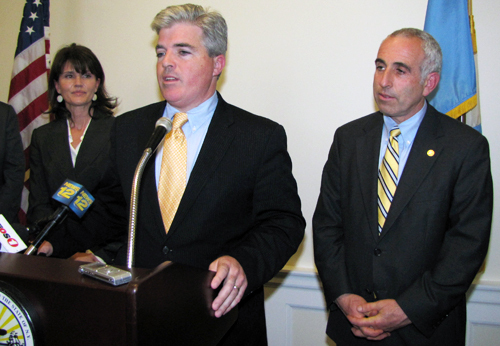 TIM GANNON FILE PHOTO | Suffolk County Executive Steve Bellone, center, and Legislator Jay Schneiderman, right, at a press conference earlier this year. East End lawmakers are divided over County Executive Steve Bellone’s recent recommendation that more county health centers transition to a federally operated model. Touting the “successful” transfer of the county’s Elsie Owens Health Center in Coram to Hudson River HealthCare earlier this year, Mr. Bellone’s preliminary 2013 budget proposes to shift three East End county health centers into the Federally Qualified Health Centers program, known as FQHC. County officials said Hudson River HealthCare — a federally operated, not-for-profit group with a network of 18 community health centers throughout the state and an office in Greenport — is being considered to take over county health centers in Riverhead, Southampton and East Hampton as well as The Maxine S. Postal Tri-Community Health Center in Amityville. There are currently no plans to move remaining western Suffolk county health centers out from under the county’s jurisdiction. Mr. Bellone said the move will save the county money because it will shift the overall cost of medical malpractice to the federal government. He maintained it will also improve the level of care by offering longer hours and providing dental services. The executive said budget limitations prevent the county from achieving these types of offerings and believes expanding additional health centers to FQHCs will enhance services at a lower cost. South Fork Legislator Jay Schneiderman (I-Montauk), whose district includes the Riverhead, Southampton and East Hampton county health centers, said he agrees the county should look into the FQHC model because it will save the county money while increasing the quality of health care. If approved, he said, the plan could go into effect as early as March. North Fork Legislator Ed Romaine (R-Center Moriches) said he’s opposed to moving quickly because he hasn’t seen any information that warrants such a change. He said the decision to transfer the county’s health center in Coram to Hudson River HealthCare was a special case because it was the only alternative to keep it open. Former County Executive Steve Levy cut the funding for that facility in his 2012 budget and a partnership with Stony Brook University Medical Center didn’t come to fruition. Mr. Romaine said an evaluation of how well the Coram health center is doing under Hudson River HealthCare hasn’t been completed and he hasn’t seen any information showing that the Riverhead health center and the two South Fork satellite offices face the same financial peril. County spokeswoman Vanessa Baird-Streeter said Mr. Bellone’s office held a conference call June 28 with legislators to discuss the county health center overhaul recommendation. Although an official evaluation of the Hudson River HealthCare takeover of the Coram site six months ago hasn’t been completed, Ms. Baird-Streeter said a steering committee will help the county decide the feasibility of switching other health centers to the federal model. Other recommendations in Mr. Bellone’s proposed $2.77 billion spending plan, which freezes general fund taxes and doesn’t call for any layoffs, include increasing the county police district budget by $12.4 million next year to fund a new police class of 75 officers in September. Only households in western Suffolk County towns will see the $27 hike in their tax bill to support the increase, since East End towns run their own police forces. The county passed a similar tax increase last year to pay for a new police recruiting class of 80 officers. Earlier this year the county laid off 658 employees and approved two controversial deals to sell the John J. Foley Skilled Nursing Facility and surplus land in Yaphank. Mr. Bellone said those decisions will help the county close its budget gap. Financial experts estimated in March that the county’s three-year shortfall will be large as a $530 million. Mr. Romaine, who is the GOP candidate in this year’s race for Brookhaven Town supervisor, said he plans to draft amendments to restore funding for East End Arts’ annual Winterfest event and for Cornell Cooperative Extension of Suffolk County programing. Those amounts weren’t immediately available. The Legislature is expected to vote on the preliminary budget Nov. 7, the day after Election Day. COURTESY MAP | This map shows the proposed county redistricting lines, which includes moving Shelter Island into the 2nd legislative district. Shelter Island and the Brookhaven Town side of Calverton and Wading River will no longer be in Suffolk County Legislator Ed Romaine’s district in 2014 if a new redistricting plan announced this week is approved. Mr. Romaine (R-Center Moriches), who represents the 1st Legislative District, said county Democrats have proposed new district lines after a nonpartisan redistricting commission failed to meet its February deadline. Under the new proposal, Shelter Island will move into the 2nd Legislative District, which is represented by Jay Schneiderman (I-Montauk). Redistricting occurs every 10 years to reflect population statistics gathered during the U.S. Census. The plan aims to a create a population of about 83,000 in each district, Mr. Romaine said. Mr. Romaine said the Legislature, which has a 12-6 Democratic majority, could vote on the redistricting plan next month. If approved, the new lines will go into effect Jan. 1, 2014. The county’s announcement comes on the heels of the New York State Assembly’s redistricting plan, which was approved in March and also lumps Shelter Island with the South Fork. Shelter Island Town Supervisor Jim Dougherty, who is also chairman of the East End Supervisors and Mayors Association, said although both East End county legislators have been active in helping preserve the island’s quality of life, he’d prefer maintaining the status quo. In addition to lumping Shelter Island with the South Fork, the proposed redistricting plan aims to move the Brookhaven Town side of Calverton into Mr. Schneiderman’s district and the Brookhaven Town portion of Wading River into the 6th Legislative District, which is represented by Sarah Anker (D-Mount Sinai). Mr. Romaine, who described the look of the new lines as a “jigsaw puzzle,” said he believes those areas should remain in his district.